Twelve years before the suffragette movement began dominating headlines, a very different women's campaign captured the public imagination. Its aim was radical: to stamp out the fashion for feathers in hats. Leading the fight was a character just as heroic as Emmeline Pankhurst but with opposite beliefs. Her name was Etta Lemon, and she was antifashion, antifeminist - and antisuffrage. Mrs Lemon has been forgotten by history, but her mighty society lives on. Few today are aware that Britain's biggest conservation charity, the RSPB, was born through the determined efforts of a handful of women, led by the indomitable Mrs Lemon. While the suffragettes were slashing paintings and smashing shop windows, Etta Lemon and her local secretaries were challenging 'murderous millinery' all the way up to Parliament. This gripping narrative explores two singular heroines - one lionised, the other forgotten - and their rival, overlapping campaigns. 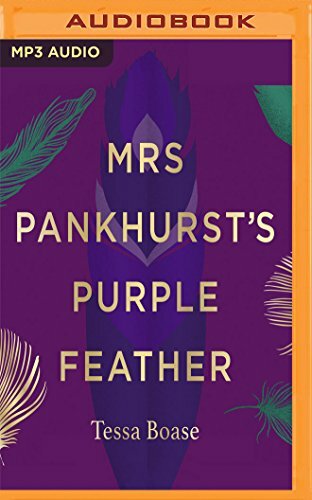 Moving from the feather workers' slums to the highest courtly circles, from the first female political rally to the first forcible feeding, Mrs Pankhurst's Purple Feather is a unique journey through a society in transformation. This is a highly original story of women stepping into the public sphere, agitating for change - and finally finding a voice. If you have any questions about this product by Audible Studios on Brilliance Audio, contact us by completing and submitting the form below. If you are looking for a specif part number, please include it with your message.